Undoubtedly you’ve had a fly buzzing around your room pestering you. At least once in your life you’ve picked up a newspaper or fly swatter and tried to get rid of it. But it seems like every time you swing the little fly avoids your attempts. 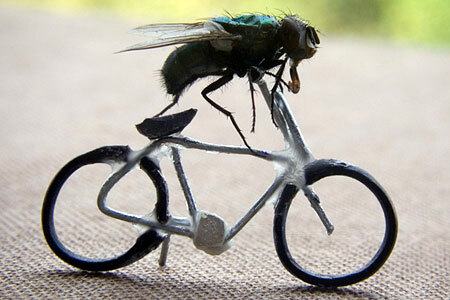 Flies aren’t as dumb as they seem. Evolution has taught their simple brains the maneuvers necessary to avoid harm and the patterns to follow to find refuge. 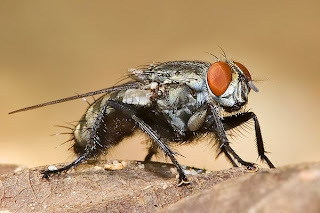 The fly’s sensory abilities, especially it’s sight, are some of the most interesting in the animal kingdom. The brain is like one large computer processor. Millions of electrical signals are fired between neurons, dictating actions within the body. These can range from breathing to the perception of things through sight. Flies are very in this sense so their abilities are limited. Fruit flies only have 300,000 neurons, 300,00o times fewer than that of a human (Flylab). Despite this they are very capable when it comes to survival. One interesting attribute of the fly is its sight. The fly uses multiple lenses to take in visual data. These different pictures combine to create an almost pixelated effect. This “low resolution” sight is slightly dangerous to the fly on its own. Luckily the fly also has the ability to capture images at a rapid rate. Its almost as if things are in slow motion. These combined allow the fly to effectively avoid danger. The fly’s brain also has the incredible ability to detect long vertical lines. It is believed that the flies think of these lines as trees and fly to them as sources of safety. At Cal Tech scientists have created a machine to test the intake of visual information by flies. LED lights surround the fly and the fly is tethered in place, only allowed to move around the y axis. Black lines appear in the LED display and every time the fly points toward the line and attempts to fly towards it. The next time you go to swat a fly pause for a moment and think. Ponder how amazing evolution is and how it has made such a simple animal so effective at survival. Maybe if you think long enough and hard enough you’ll be able to find a way to apply their evolutionary abilities to human technology. You’d also still have a fly buzzing around in your room.